As a result of the media frenzy over this week’s Hotmail debacle, it would be easy to overlook another major story that concerned security on the Internet. On August 22, a vast team of researchers from Britain, the Netherlands, France, Canada and America announced that they had cracked a code known as RSA-155, the sort of encryption that can be used to protect e-mails and financial transactions on the Internet. However, the breaking of RSA-155 does not demonstrate the weakness of current encryption methods, but rather their strength. First of all, it took the international collaboration over three months to crack the code. Furthermore, RSA-155 is a crippled version of the standard RSA encryption system, one that is effectively unbreakable, and one that is used routinely for encrypting messages on the Internet. RSA Data Security Inc. had created the RSA-155 encrypted message especially for codebreakers, in order to test the current state of codebreaking technology. Had they encrypted a message using full-strength RSA, then nobody one have broken it, and RSA Data Security Inc. would not be able to gauge the potency of new codebreaking techniques. As an incentive to tackle RSA-155, the company offered a prize of around $10,000, and now that the money has been won, they will set a new challenge with a new prize. However, codebreakers who are looking for the ultimate challenge might like to tackle an, as yet, uncracked code from the 19th century. Whoever unravels the so-called Beale ciphers will earn a reward of over £10 million in gold, silver and jewels. The story of the Beale ciphers begins in January 1820, when a stranger by the name of Thomas J. Beale rode into the town of Lynchburg, Virginia, and checked himself into the Washington Hotel. Although Beale spent the rest of the winter in Lynchburg and was “extremely popular with every one, particularly the ladies,” he never spoke about his background, his family and the purpose for his visit. Then, at the end of March, he left as suddenly as he had arrived. Beale returned two years later, and once again he spent the rest of the winter in Lynchburg and disappeared in the spring, but not before he entrusted Morriss with a locked iron box, which he said contained “papers of value and importance.” Morriss dutifully guarded the box, waiting for Beale to collect it, but the swarthy man of mystery did not return to Lynchburg. He disappeared without trace, never to be seen again. The note went on to explain that Beale and his men mined the site for the next eighteen months, by which time they had accumulated a large quantity of gold, as well as some silver which was found nearby. In due course, they agreed that their new found wealth should be moved to a secure place, and decided to take it back home to Virginia, where they would hide it in a secret location. To reduce the weight, Beale traded some of the gold and silver for jewels, and in 1820 he travelled to Lynchburg, found a suitable location, and buried the treasure. It was on this occasion that he met Morriss for the first time. When Beale left at the end of the winter, he rejoined his men, who had continued to work the mine during his absence. After another eighteen months, Beale revisited Lynchburg with even more to add to his stash. This time there was an additional reason for his trip. His companions were concerned that, in case of an accident to themselves, then the hidden treasure would not find its way to their relatives. Hence, Beale was instructed to find a reliable person, who could be confided in to carry out their wishes in the event of their sudden death, and Beale selected Morriss to be that person. Upon reading the note, Morriss felt responsible for finding the treasure and passing it onto the relatives of the presumably dead men. Unfortunately, there was a problem. The description of the treasure, its location, and the list of the relatives had been encrypted, and had been transformed into the three sheets that contained nothing but numbers. Beale’s note said that the key required to decipher the sheets would be posted to Beale by a third party, but it never materialised, and so Morriss was forced to unscramble the three sheets from scratch. This task occupied his mind for the next twenty years, and ended in complete failure. In 1862, at the age of 84, Morriss knew that he was coming to the end of his life, and realised that he had to share the secret of the Beale ciphers, otherwise any hope of carrying out Beale’s wishes would die with him. Morriss confided in a friend, but unfortunately the identity of this person remains a mystery. Only two things are known about Morriss’s friend. First, he published a pamphlet, which contains the entire Beale story, including the Beale ciphers and Morriss’s account of the events surrounding the mystery. Second, the anonymous pamphleteer made the first breakthrough in deciphering one of Beale’s cryptic papers. 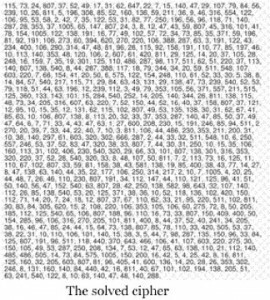 The second Beale cipher, like the other two, contains about 800 numbers, beginning with the sequence; 115, 73, 24, 807, 37, … The pamphleteer guessed that each number corresponded to a word in the Declaration of Independence. For example, the first number in the sequence is 115 – the 115th letter of the Declaration is ‘instituted’, which begins with the letter I. Hence the first number, 115, represents the letter I. The second number in the sequence is 73 – the 73rd word in the Declaration is ‘hold’, which begins with the letter H. Hence, the second number, 73, represents the letter H.
anonymous so as not to be pestered by eager treasure hunters. became interested in 1923 and who continued with his obsession right through to the 1970s. He, too, had nothing to show for his efforts. The lack of success means that we cannot exclude the possibility that the Beale ciphers are an elaborate hoax. Sceptics have searched for inconsistencies and flaws in the Beale story. For example, Beale’s letter enclosed in the box with the ciphers was supposedly written in 1822, but it contains the word “stampede”, which was not seen in print until 1844. However, it is quite possible that the word was in common usage in the wild west at a much earlier date, and Beale could have encountered it on his travels. Evidence in favour of the probity of the ciphers comes from historical research, which can be used to verify the story of Thomas Beale. Peter Viemeister, a local historian who showed me some of the places where treasure hunters have already looked, searched for evidence to prove that Thomas Beale existed. Using the census of 1790 and other documents, Viemeister has identified several Thomas Beales, who were born in Virginia and whose backgrounds fit the few known facts. Most of the details we have about Beale concern his trip to Sante Fe, and there is evidence to corroborate his discovery of gold. For example, Jacob Fowler, who explored the American southwest in 1821-22, noted in his journal that the Pawnee and Crowe tribes “speake on the most friendly terms of the White men and Say they are about 35 in number” – this number is similar to the size of Beale’s party. Also, there is a Cheyenne legend dating from around 1820 which tells of gold and silver being taken from the West and buried in Eastern Mountains.